Festive taqueria with hard-core, group-pleasing (and happy hour appropriate) 'ritas and standard Mexican faves. : The garden (Jardin) is a pleasant enough place to enjoy one of the booziest margaritas in town, and the salsa isn’t half bad either. From there, you can move through the traditional Mexican repertoire, knowing none of it --- chiles rellenos, tamales, carne asada, nachos and tacos --- will wow you, but also won't offend you. 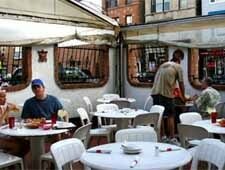 The restaurant’s real standout feature is the large, boisterous patio.